How would you describe the average company’s mission and vision statements? Generic, meaningless and confused are the first words that come to my mind. In my experience, mission and vision statements are often a hot mess of goals, values, aspirations, philosophies, strategies and descriptions – so it’s no wonder people often get the two confused. At one end of the spectrum you have tired corporate-speak that ultimately says nothing of substance about the business. I’m looking at you Volvo, with your mission to “drive prosperity through transport solutions”. Although, to be fair, that is better than Volvo’s previous, snooze-inducing mission statement: “By creating value for our customers, we create value for our shareholders. We use our expertise to create transport-related products and services of superior quality, safety and environmental care for demanding customers in selected segments...” Hello? Are you still awake? These kinds of boring statements have been painfully wordsmithed, often by committee in long, drawn-out meetings. In the end, everyone is so fed up they agree to any old rubbish just so they can go outside and see the sunlight again. I know because I’ve been in exactly those sorts of meetings (and you probably have, too). Sometimes, reading these mission and vision statements can feel a bit like playing word bingo. Phrases like “be the most successful”, “superior” “best” and “market-leading” crop up time and time again. But when everyone is using the same few phrases, mission and vision statements ultimately become meaningless. Then, at the other end of the spectrum, there’s the hilariously grandiose over-statement. Hilton, for example, really went for it with their vision “To fill the earth with the light and warmth of hospitality”. As someone who spends a fair bit of time in Hilton hotel rooms, I’d say “To roll out consistently sterile corporate hotel rooms around the world” is probably more accurate. I’m all for aiming high, but it helps if your vision bears some relation to reality. What’s more, far too many companies confuse the two statements, often ending up with a mission that’s more like a vision. As a result, people who take the time to read these statements can end up confused about the purpose and direction of the business. So what exactly is the difference between the two? A mission statement sets out the company’s purpose. This is your opportunity to articulate why the business exists, what purpose it serves, and for whom. You’re essentially answering the question “What do we do?” It’s very important to focus on the here and now in your mission statement, and not get into where you want to be in the future. I actually prefer the name “purpose statement” instead of mission statement, as I think it’s a more accurate description. A vision statement outlines the company’s goals and aspirations for the future – think “this is where we’re heading and this is what we want to achieve”. Your vision statement should create a mental picture of a specific medium-term target and act as a source of inspiration and motivation (but in a way that bears some resemblance to reality!). It’s a bit like a guiding star and, as such, might be better described as an “aspiration statement”. Some companies also have a values statement, which sets out the values that are most important to the business. Whether you have a value statement is up to you, but I think it’s essential to have separate mission and vision statements that clearly define where the business is now, and where it wants to be in the future. The very best mission and vision statements act as powerful signposts, providing crystal-clear directions for the reader about the company’s purpose and aspirations. They’re also “real” and meaningful, not just tired corporate platitudes. You don’t get much clearer and more inspirational than that! Other great examples include eBay’s mission to “provide a global online marketplace where practically anyone can trade practically anything” and Save the Children’s vision of “a world in which every child attains the right to survival, protection, development and participation”. I really hope this article has cleared up the difference between mission and vision statements and inspired you to rethink what your company says about itself. By stating the business’s purpose and ambition in a clear, relatable and unique way, you’ll have created mission and vision statements that interest and inspire people both inside and outside the organisation. 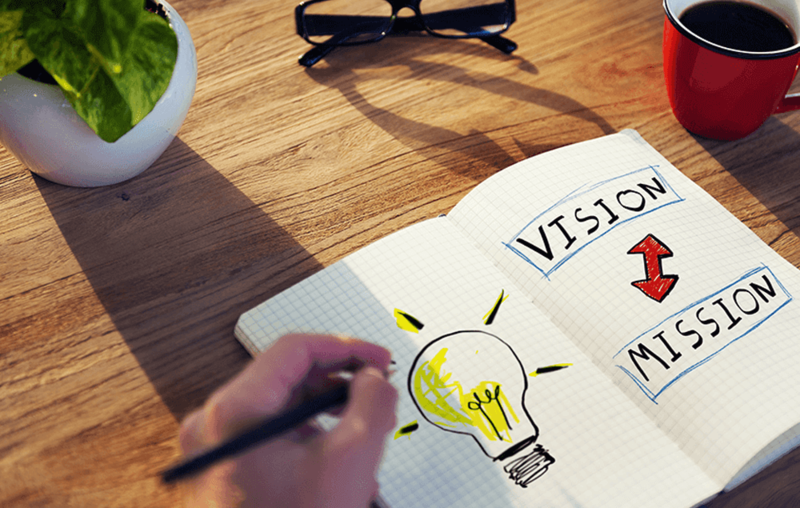 How Do You Write an Amazing Vision Statement?